One of the best things about blogging is getting to meet people one would normally not have the chance to meet in this life. Last October, I had the wonderful opportunity to meet Maya of Infusions in Tokyo (cross fingers, we may meet again this April!) And just last Sunday, I met Janet of Ecoviolet Soap and her husband in Manila. Janet already wrote me months ago about her plans for a first-time visit to the Philippines and Thailand – the birthplaces of her mother and father, respectively. When she had finally firmed up her schedule, I wasn’t sure if I could fly to Manila on those dates. But our meeting was meant to be; just a few days beforehand, my husband said we were going to Manila to see an art fair and to visit his parents. I was so excited when I realised the dates coincided with Janet’s visit! 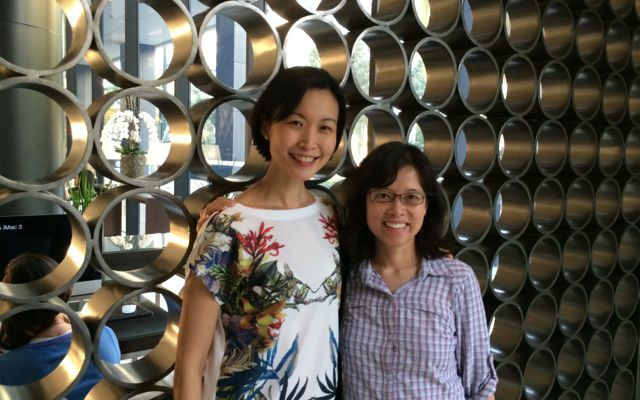 Despite her tight schedule, we managed to meet, albeit it was just for two short hours – so not enough, as you can imagine! Janet is a brilliant chemical engineer who is currently taking up her master’s in statistics. 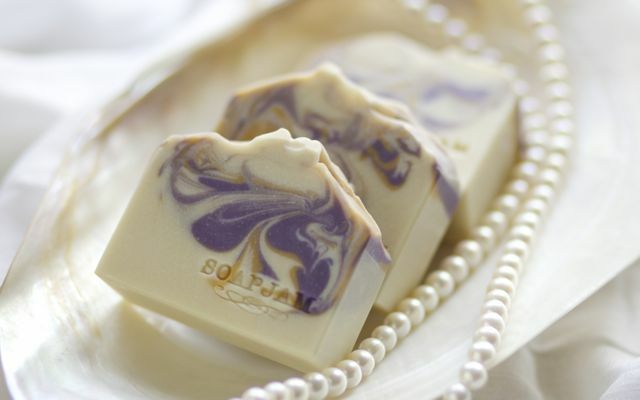 With her background, making soap is almost second nature to her. I love learning about the scientific part of soap making, and talking with Janet felt like I was meeting Kevin M. Dunn himself! This entry was posted in Cold Process, Others, Travel on February 11, 2015 by soapjam. Fortunately, and conveniently, hubby is intensely creative and a photography buff who really knows his stuff. He has been casually giving me pointers but I can be a scatter brain when I don’t make an effort to focus. When I annoyingly repeat the same question, that’s when he tells me to do my homework and read up. But this time I am intent on learning. I have been inspired by the gorgeous works of Clara Lindberg of Auntie Clara’s, and Zahida Map of Handmade in Florida. 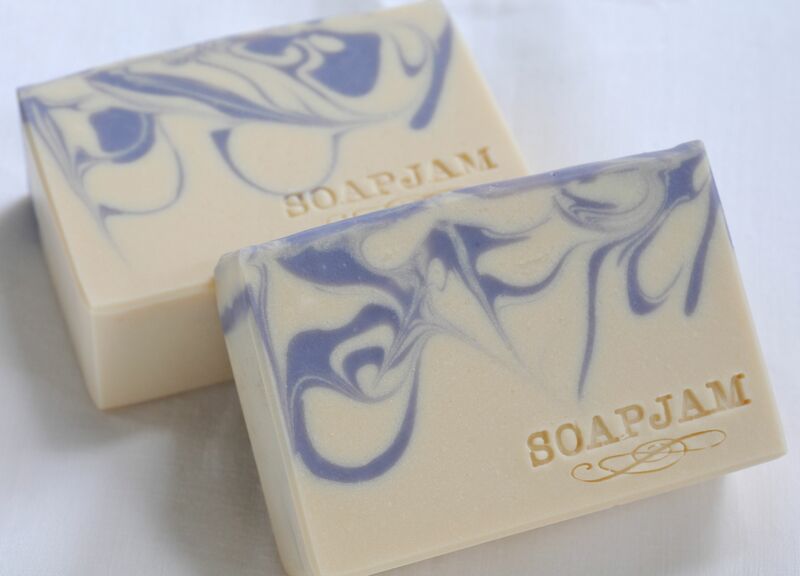 This entry was posted in Cold Process, Others and tagged soap photography on February 4, 2015 by soapjam. My best friend went to Japan last April and she came home with the strangest looking soap for me. It’s supposed to be a cherry blossom soap but to my nose it smelled more like lychee. It was packed in plastic-lined paper (shown in the background, under the tag) and it was swimming in a bit of liquid. 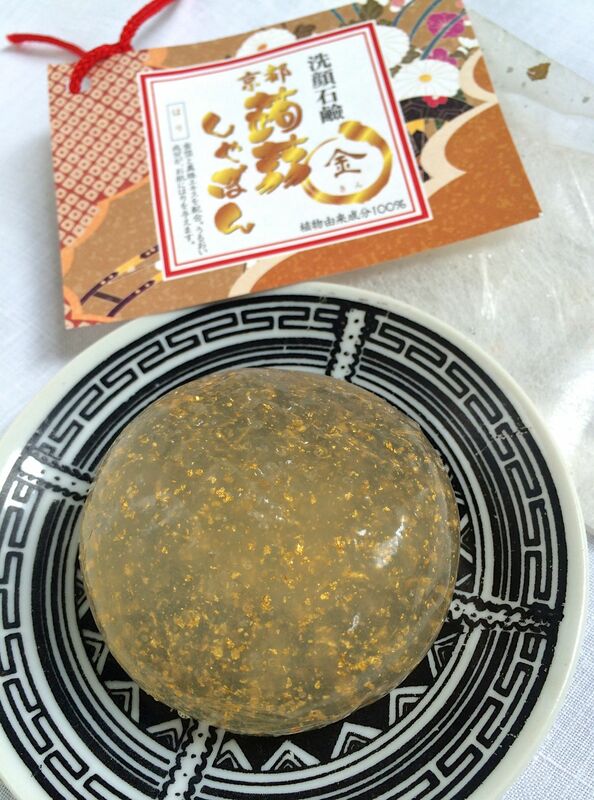 I had to google about this jelly-like soap, and as it turned out, it was something Lush popularised a few years ago that spawned many copycats. I would not be surprised if Lush got the idea from Japan. The Japanese are always coming up with the coolest and most unique ideas. I’ve been saving this soap to blog about. With that out of the way, I can finally use this squishy fun soap tonight! Wheee! 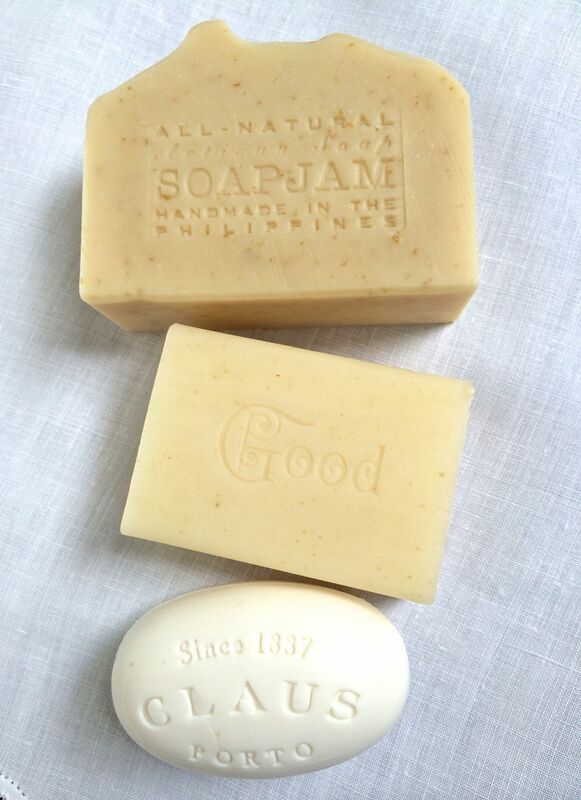 Nearly every time I research on soap packaging, I come across Izola soaps. It was thus a pleasant surprise to be holding it in person, thanks to my Hong Kong-based friend who sent it to me for soapy inspiration. She likes the size of the soap and the way it’s packaged as a set. 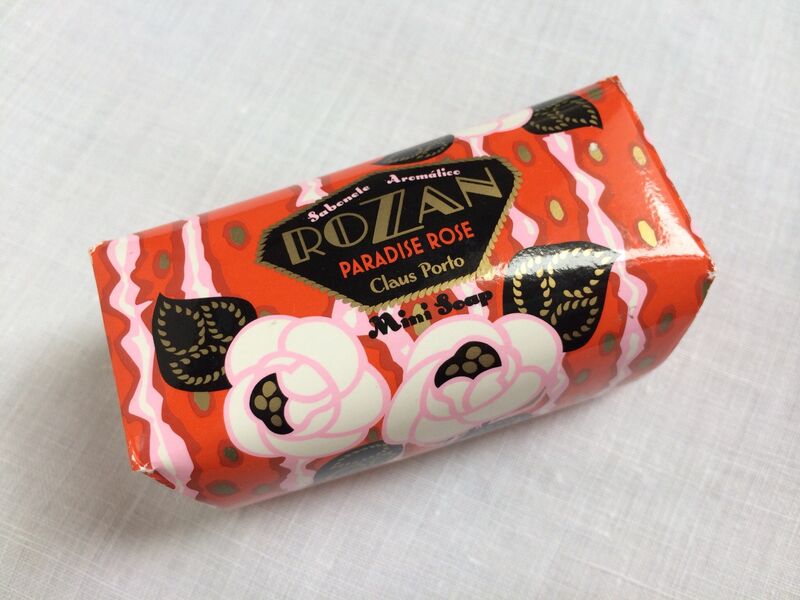 She also sent me a Claus Porto soap for its scent, called Paradise Rose. 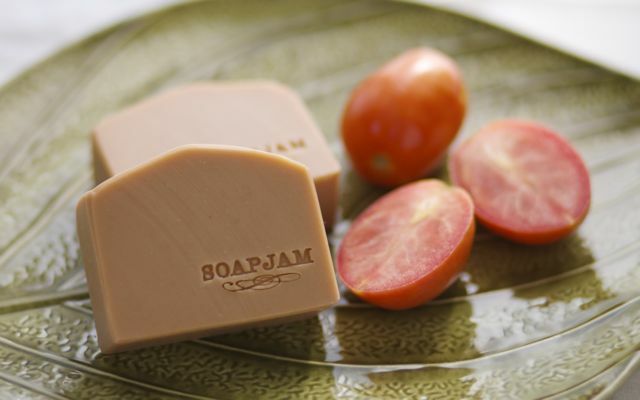 This entry was posted in Cold Process, Others, Packaging, Perfumed Soap on July 27, 2014 by soapjam. I had high hopes for the beautiful avocado green colour that moringa-infused oil lends to soaps, but alas, it lasts for about 7-8 weeks only before it starts to fade. 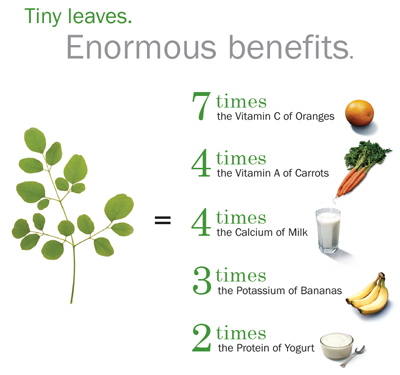 Nonetheless, I am still excited about moringa especially for my healing balm. I have given it to many people and they all find it effective in alleviating itch from insect bites and various allergies and skin conditions such as eczema and dermatitis. One even did a side by side test on her infant’s skin irritation. She claims that the healing balm worked faster and better than the cream prescribed by her paediatrician. Virgin coconut oil infused with moringa powder for at least one month. Previously I used olive oil. I bought a bag of powdered moringa from a fair last January. I couldn’t find the contact details of the supplier so I decided to make my own. The first time I tried to dry moringa leaves, I placed it in a net and hung it to dry. I forgot about it and the next time I looked at it, weeks later, all the leaves had turned yellow and brown, leaving me no choice but to throw them away. I did some research and learned that it should be air dried for 3 days only and toasted very briefly on a hot pan. I had a lot of moringa last week and determined to get it right this time. I was not able to take photos of the leaves being hung to dry because less than 24 hours later, the small leaves started coming off. I finished drying the leaves – removed from the stems – on a tray. After 3 days, the leaves felt dry but it was only after toasting them briefly that they became “crunchy” and crumbled easily. I ground up the leaves using my small Krups coffee/spice grinder and sifted the powder twice. It’s still not as soft and fine as the one I bought from the fair. There is a also a marked difference in the colour. 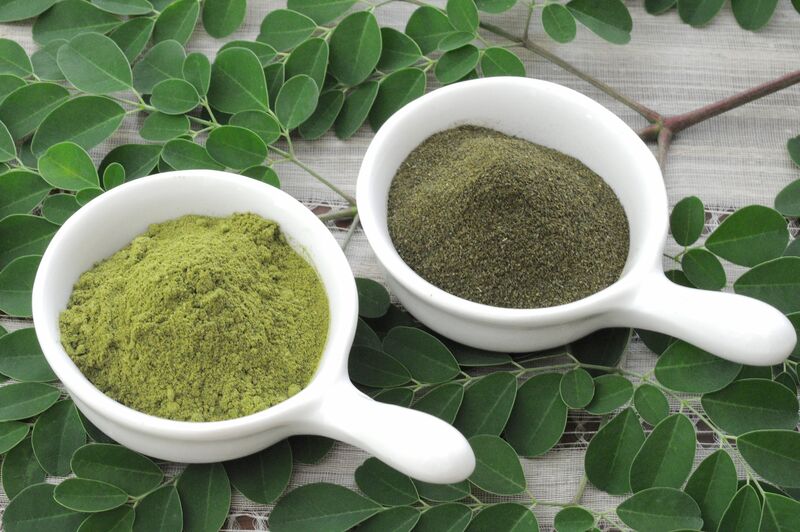 The photo above was taken one week after I made the moringa powder. It was a deep green then, but now it has darkened to a fatigue green. 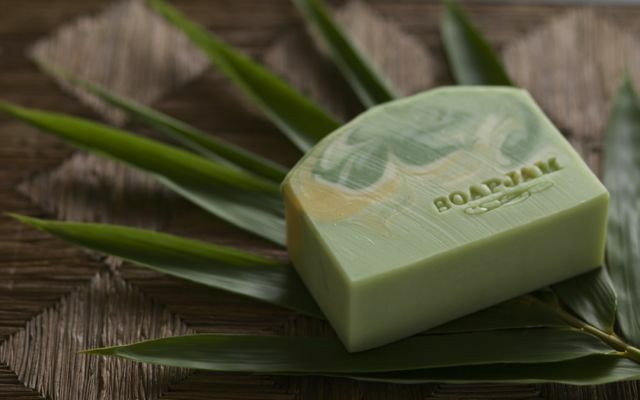 In this post in which I had an avocado moringa soap scented with eucalyptus, Monica asked me if I was planning to use the actual leaves in some of my future soaps. That got me curious. All I had to do was grab some leaves from the trees across my house. I don’t know what type of eucalyptus trees they are, but for sure they are not eucalyptus deglupta, also known as rainbow eucalyptus for their attractive multi-coloured trunk and believed to be native to the Philippines. The ones across my house have a white trunk. I air-dried the eucalyptus leaves for 5 days before cutting them up into small pieces and briefly toasting them in a wok like I did the moringa leaves. I love the way the house smelled of eucalyptus when I was grinding up the leaves, and I also love the vibrant green colour that reminds me of green apple. The net yield is very low. Most of it are too tough and fibrous to be made into a powder with a coffee grinder. I thought I had a lot, but all those leaves in the above photo yielded only 17 grams after sifting 3 times. 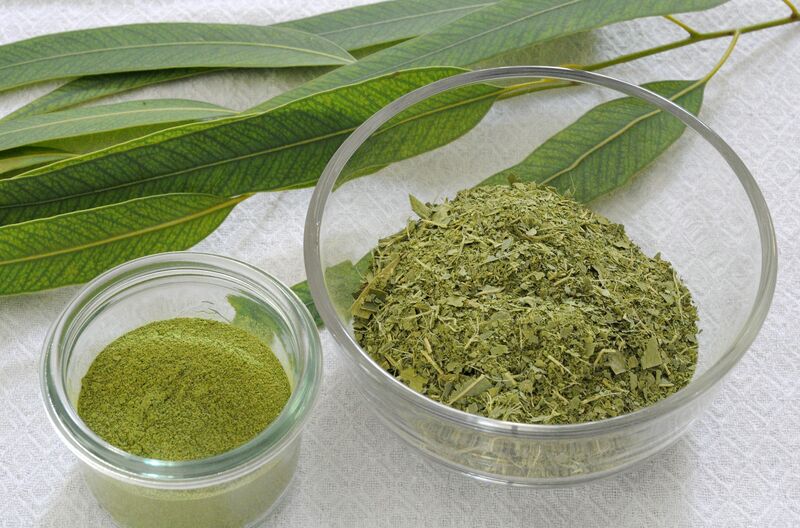 Unlike moringa leaves that are soft, eucalyptus leaves are hard and fibrous. Most of it were too coarse and had to be discarded. I still have to plan how I’m going to use it in soap. I am sure the colour will fade away, like most plant-based colorants, so I will be using it as an exfoliant. For simple pleasure’s sake, I hope the colour will stay even just for a few short months. This entry was posted in All-Natural, Others and tagged dried eucalyptus, dried moringa, eucalyptus, moringa on June 29, 2014 by soapjam. We joined our first bazaar last Saturday and we couldn’t have been more thrilled! I found out about it through my best friend just a few days before, and even though it was at very short notice, the opportunity was simply too good to pass up. The bazaar was organized for the members of Entrepreneurs Organization or EO Philippines. 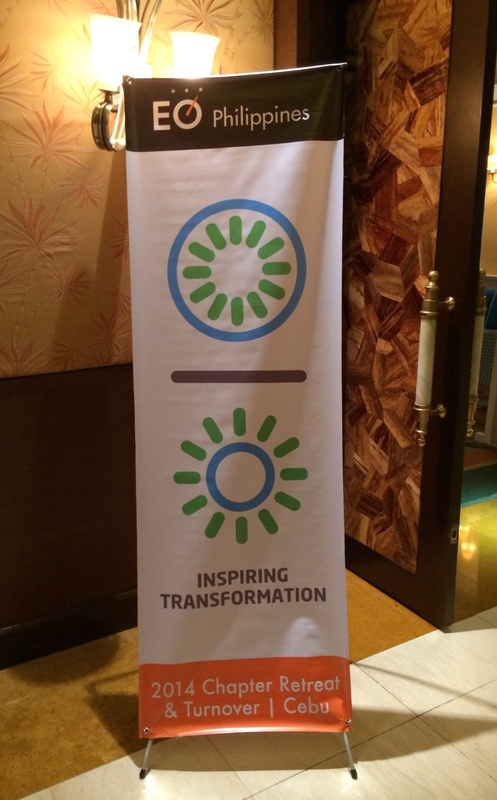 It was held in one of the smaller ballrooms of Shangri-La’s Mactan Resort and Spa. I was thankful that we were not outdoors as it would have been too hot. 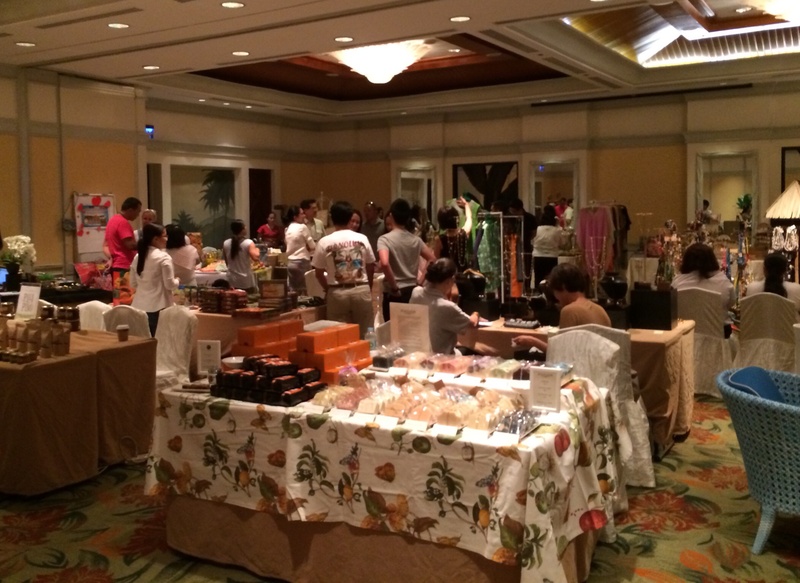 It was an intimate mix of vendors selling artisan jewelry and accessories, hand-embroidered clothes, resort wear, cosmetics, food, home accents, etc. I enjoyed meeting the other vendors as much as I did with the customers. It was fun and interesting to see customers’ reactions as they smelled the soaps. 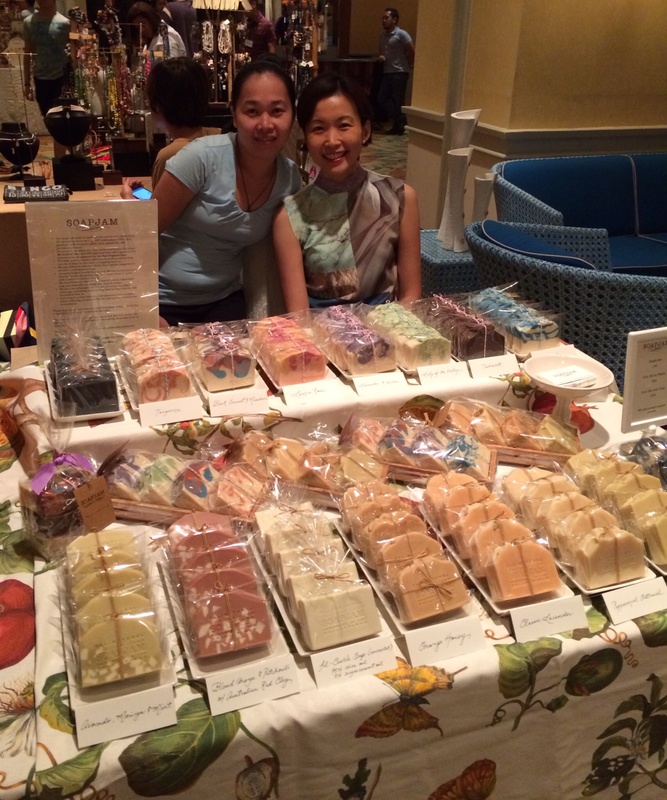 They seemed to get a kick out of the Tsokolate soap made with our native chocolate called tableya. It looks and smells like real chocolate! The best-seller was Black Currant & Mandarin. Eyes lit up and lips curved into a smile when they smelled it. That’s me sitting on the right and Dyna on the left. New calling cards. The contact details are at the back. The bazaar pushed me to have calling cards made. It was such a rush job, but Warren of Drawing Board Creative was able to layout and print a simple but elegant design for me. I was also forced to come up with a tag line for the calling cards. The message I wanted to convey about the brand has been in my head for months but finding the few right words proved to be a challenge. So, finally, my tag line is: a treat for the skin, an adventure for the senses. I think it captures my idea, but I am still open to tweaking it. What do you think? 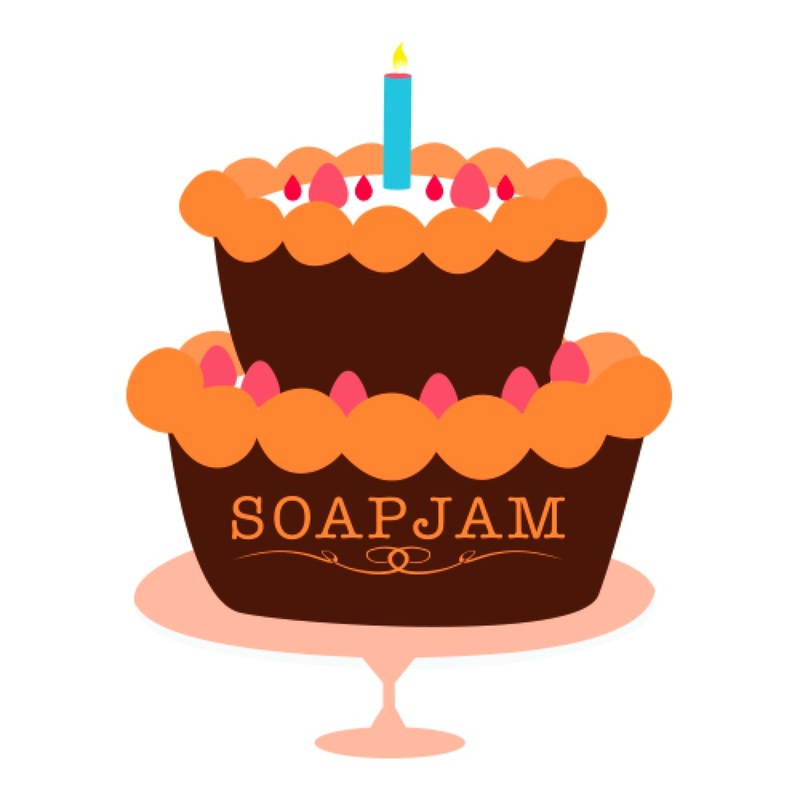 This entry was posted in Others and tagged Bazaar, tag line on June 11, 2014 by soapjam. I want to make soap all the time that it’s hard for me to venture into other skin care products. But I promised myself that this year I was going to accomplish the items on my to-do list. I am happy to report that I have already ticked off two items. 1. All-Around Skin Balm – This is my third time to make this, but each time I slightly tweak the formula. It is jam-packed with all things good for the skin. The lovely light avocado green colour comes from olive oil infused with moringa powder. 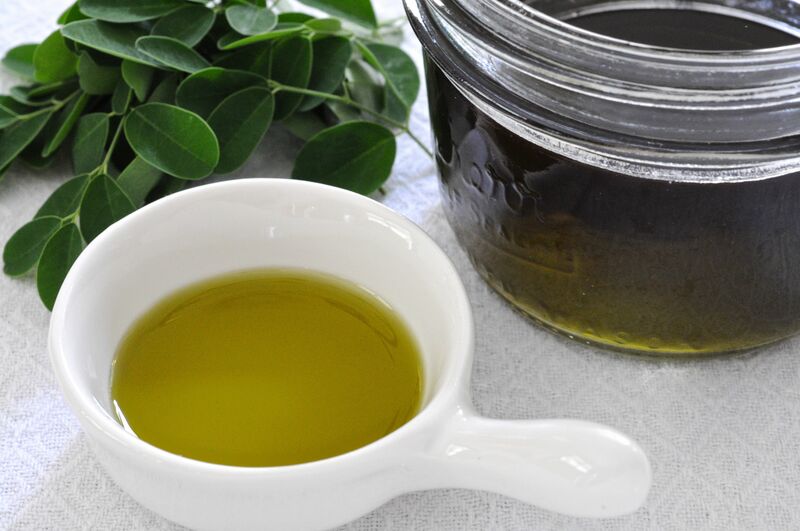 Aside from the moringa-infused olive oil, the balm also contains: cocoa butter, beeswax, virgin coconut oil, pili oil (canarium luzonicum or canarium ovatum), vitamin E, and several essential oils and herbal infusions known for their skin healing properties. Last month I tried adding turmeric-infused virgin coconut oil, but it caused a bit of yellow staining. So far the people I’ve given the balm to like it. They’ve noticed that itching from mosquito bites instantly goes away. 2. 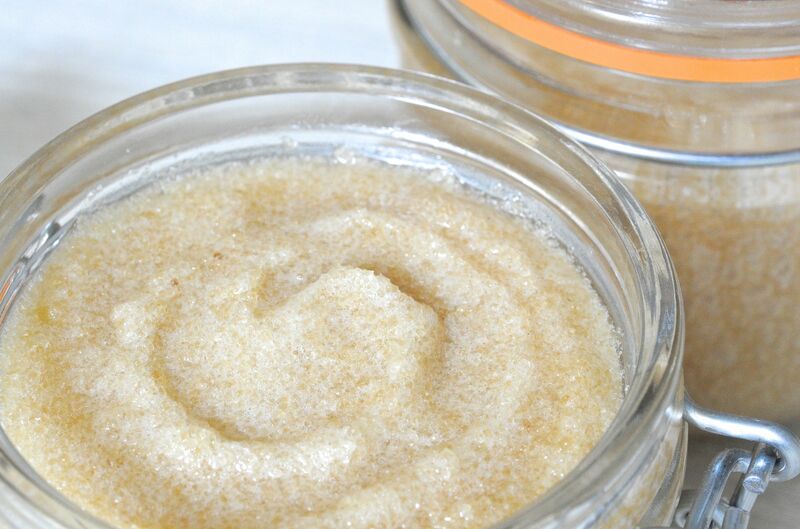 Sugar Scrub – I made a very simple sugar scrub last year and I liked the way it made my skin feel so smooth. This year I wanted to try the emulsified kind. I could have made it months ago, but I have been dilly dallying until Cee of Oil and Butter came out with her tutorial, and I really had no more excuse to put it off. The first time I made this a few days ago, I did not even bother to whip the fats. It yielded 2 small jars (about 2 cups) and I gave them to my 2 sisters. Last night I made another batch, and this time I whipped the fats. It became fluffy, and mayonnaise-like. Because of the incorporated air, I was able to get 3 jars. Since it is hot where I live, I wonder if the mousse-like scrub will eventually deflate – like whipped cream left out in the heat. I basically followed the recipe provided by Cee but substituted the grape seed oil with almond oil and the shea butter with coconut oil. 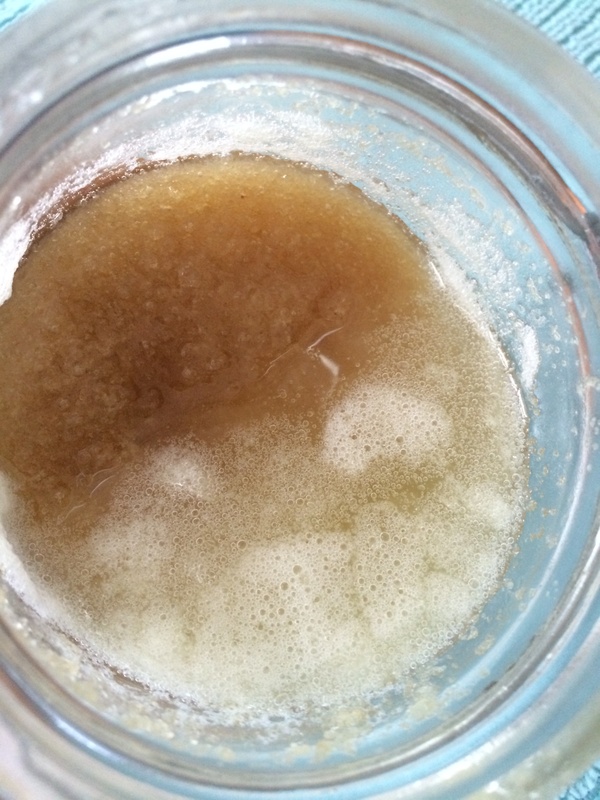 This entry was posted in Others and tagged emulsified sugar scrub, healing balm, skin balm, skin salve, Sugar Scrub on April 20, 2014 by soapjam. It’s hard to believe it has been a year since I made my first soap. I remember how nervous and excited I was. The soap didn’t turn out so well, but taking that first step made me realise that soap making wasn’t as scary or difficult as I thought it would be. It is, however, very challenging and highly addicting! My “Ambitious” soap had the most notable change. The off-white portion used to be orange from the turmeric. Since it was wrapped with paper, I wouldn’t know when the colour started to fade. Click here to see how it looked a year ago, and to know why I called it Ambitious Soap. The only bar that developed the dreaded orange spot, or DOS, was the aloe vera soap. Out of the 4 bars that I kept, it appeared only on one. The beer and egg soap shrunk the most. I wrote the recipe here. As you can see, the liquid content was really high. My first few batches were at around 28% lye concentration. As I understood soap making more, I moved it up to 33%. These days I normally soap at 35-37% lye concentration. And now, for the winner of the giveaway……. 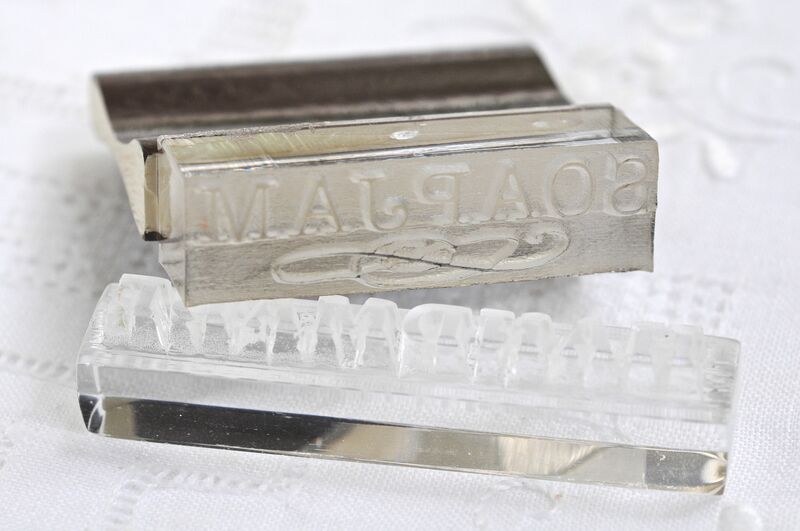 The custom soap stamp goes to Maja of Diva Soap! I wrote the name of every participant on a piece of paper and noted whether it came from my blog or Facebook. Maja had an entry in each, and it was her Facebook entry that got picked. In this case, having the highest probability worked in her favor. Congratulations, Maja! 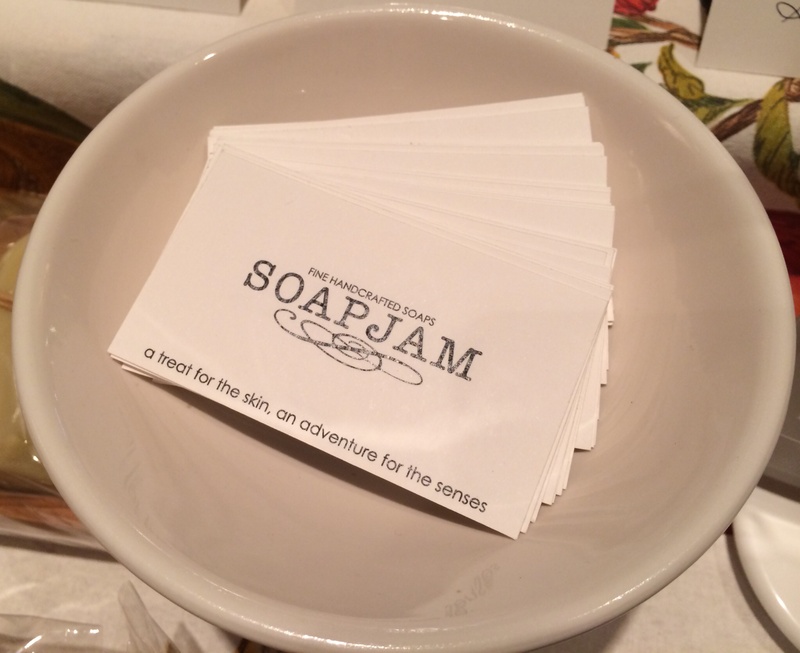 Please email me your logo at info at soapjam dot com. 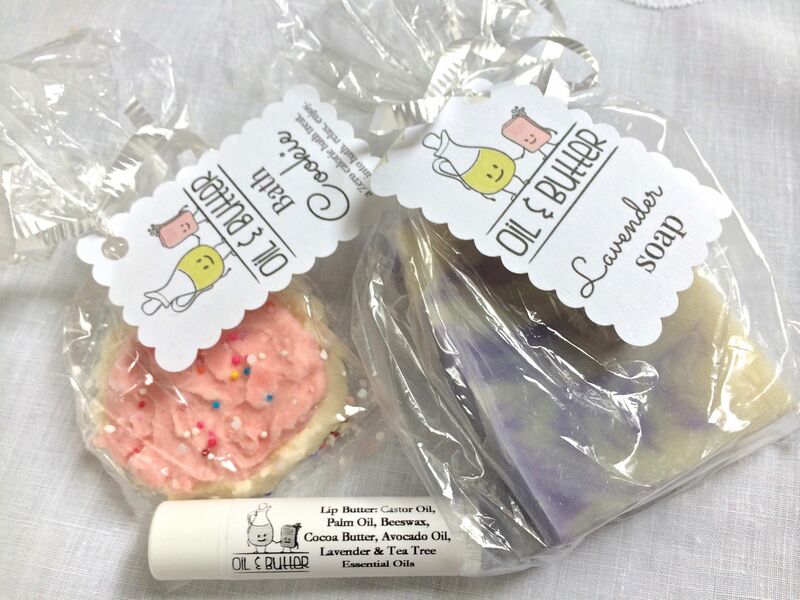 This entry was posted in Cold Process, Others and tagged anniversary, giveaway, soap stamp on April 3, 2014 by soapjam. Since getting my stamp last month, I still haven’t mastered the precise way of stamping soaps – sometimes I hammer too hard, or too lightly, or lopsidedly. But one thing for sure is that I love stamping soaps and the resulting look. To celebrate my first soap anniversary this April 3, I thought I’d share the joy by giving away an acrylic stamp with your own logo or design. 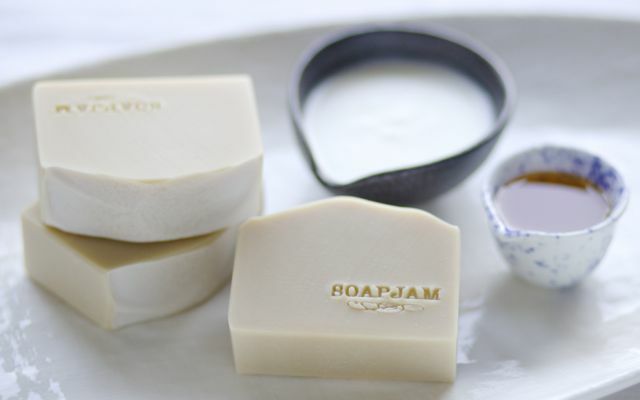 All soap makers from anywhere in the world are welcome to join! All you need to do is share your favorite soaping tip or trick in the comments section, or on Facebook (would be awesome, too, if you “like” SoapJam 🙂 ). If you have already written a post or tutorial about it, a link would be highly appreciated. If you share a soaping tip or trick here, and another one on Facebook, it will count as 2 entries. 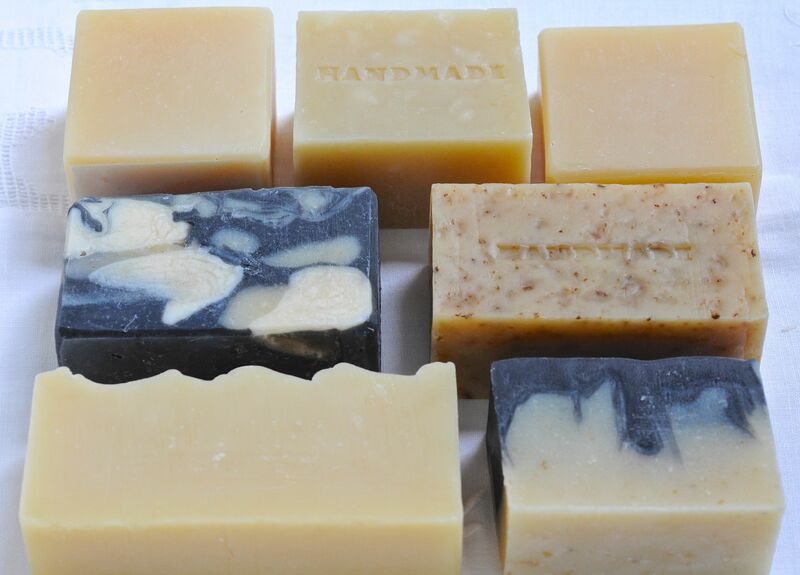 The idea is to provide a resource for soap makers – a kind of pay-it-forward. Cut-off will be on April 2, 9 PM Philippine time, and the winner will be announced the following day. I will need a pdf file of your logo or artwork to have your custom stamp made. If you are not yet ready with your logo, we can wait. The stamp I will be sending is going to be the acrylic portion only, without a handle. It works fine without a handle, but if you wish, you can buy a generic wooden handle and glue it to the stamp. For my own contribution, here’s a link to a tutorial I made on Lye Masterbatching. This entry was posted in Cold Process, Others and tagged anniversary, Drop Swirl, give-away, soap stamp on March 27, 2014 by soapjam.